A series of free concerts by faculty and student ensembles in late October showcases the variety of talent and artistry in the College of Music and Fine Arts at Loyola University New Orleans. All events are open to the public and part of the Montage Fine and Performing Arts Series. On Sunday, Oct. 20 at 3 p.m., the NOVA Chorale and the Loyola Chamber Singers, directed by Meg Frazier, D.M.A., will present Sergei Rachmaninoff’s masterpiece, “Vespers,” at Temple Sinai, located at 6227 St. Charles Ave., adjacent to Loyola's Communications/Music Complex. 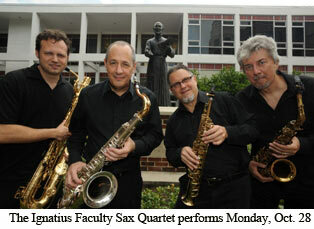 The Ignatius Faculty Sax Quartet will present a salute to the saxophone craze that was sweeping the country during the Roaring 20s, Monday, Oct. 28 at 7:30 p.m. in Louis J. Roussel Performance Hall. “Saxophone Music of the 1920’s” includes popular radio and vaudeville music from that era, including works by Eddie Cantor, Rudy Wiedoeft and Kurt Weill. Music by the Six Brown Brothers, a group of saxophone virtuosi popular onstage in New Orleans at the time, is also included. On Tuesday, Oct. 29 at 7:30 p.m., the James Carter String Quartet will perform a series of violin duets and violin/viola duets, including compositions by Leo Weiner and Moritz Moszkowski, among others. The performance is set for Roussel Hall, and performers include Loyola faculty members Rachel Jordan, violin; Bruce Owen, viola; Amy Thiaville, violin; and Yui Asano, piano.